With homes today having access to the most amazing materials imaginable for counters, floors and wall back-drops, it is possible to have the kitchen design style you only see in the most prestigious of homes. Sergei Kaminskiy owner of Kaminskiy Design and Remodeling is seeing are real boom in home remodels today. According to Kaminskiy many are choosing to remodel than go through the expense of moving. Kaminskiy offers tips for homeowners thinking about remodeling in 2015. With home remodelers having access to the most amazing materials imaginable for counters, floors and wall back-drops, it is possible to have the kitchen design and style that in the past were only seen in the most prestigious of homes. With a dependable design and remodeling expert, who truly loves crafting amazing home and kitchen makeovers, homeowners can have the white kitchen, eclectic kitchen or country style kitchen you have only dreamed of. 1- Think about traffic flow: Paths throughout a kitchen should be at least 36 inches wide. Paths within the cooking zone should be 42 inches wide for a one-cook kitchen and 48 inches wide for a two-cook configuration. When planning, adjust kitchen islands and peninsulas accordingly. For kid-friendly kitchen designs, keep the cooktop out of traffic areas so children don't catch handles and cause spills when running through. Also, make the refrigerator accessible to both passersby and people working in cooking and cleanup areas. 2- The right height for microwave: The best height and location for a microwave oven depends on the chef and the degree of kid-friendliness desired in the kitchen. For adults, 15 inches above countertop level is a good microwave height. For kids, a below-countertop setup might be safer and more suitable. 3- Determine the functionality of your island: When it comes to kitchen islands, form follows function. If you want to cook and eat on kitchen islands, plan enough space so the cooktop is safely separated from the dining area. 4- Plan for landing space around cooking appliances: When designing your kitchen, allow 15 inches of countertop on each side of a cooktop and refrigerator. Landing space is also important near the microwave. 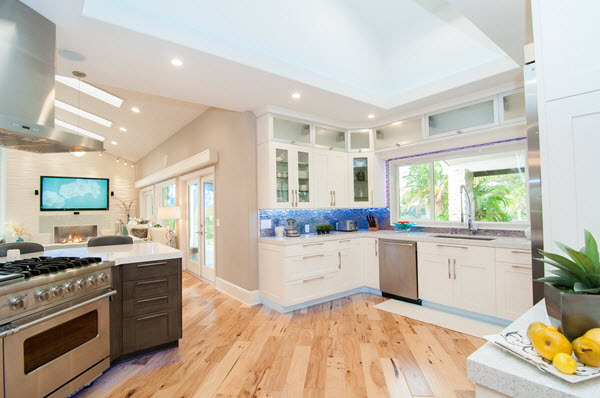 5- Pick a focal point: Splashy tile, fancy floors, sizable range hoods, bright kitchen cabinets, and busy countertop patterns give the eye too much to look at. Pick one focal point in your kitchen design and complement that area with a few other quieter, eye-pleasing details. 6- Design with ergonomics in mind: Drawers or pull-out shelves in base cabinets; counter heights that can adjust up or down; a wall oven instead of a range: These are all features that make a kitchen accessible to everyone — and a pleasure to work in. 7- Try not to move plumbing: Nothing will drive up the cost of a remodel faster than changing the location of plumbing pipes and electrical outlets, and knocking down walls. This is usually where unforeseen problems occur. 8- Choosing Appliances- Try to stick with the same brands throughout. It’s easy to get carried away when planning your new kitchen. A six-burner commercial-grade range and luxury-brand refrigerator may make eye-catching centerpieces, but they may not fit your cooking needs or lifestyle. Task Lighting: Under-cabinet lighting should be on your must-do list, since cabinets create such dark work areas. And since you’re remodeling, there won’t be a better time to hard-wire your lights. Plan for at least two fixtures per task area to eliminate shadows. Pendant lights are good for islands and other counters without low cabinets. Recessed lights and track lights work well over sinks and general prep areas with no cabinets overhead. Ambient lighting: Flush-mounted ceiling fixtures, wall sconces, and track lights create overall lighting in your kitchen. Include dimmer switches to control intensity and mood. Establish a communication routine: Hang a message board on site where you and the project manager can leave daily communications. Give your email address and cell phone number to subs and team leaders. Set house rules: Be clear about smoking, boom box noise levels, available bathrooms, and appropriate parking. Be kind: Offer refreshments (a little hospitality can go a long way), give praise when warranted, and resist pestering them with conversation, jokes, and questions when they are working. They’ll work better when refreshed and allowed to concentrate on work. Let a trusted and experienced home remodeling and design expert in San Diego share the cost benefits of a remodeled kitchen for your home!